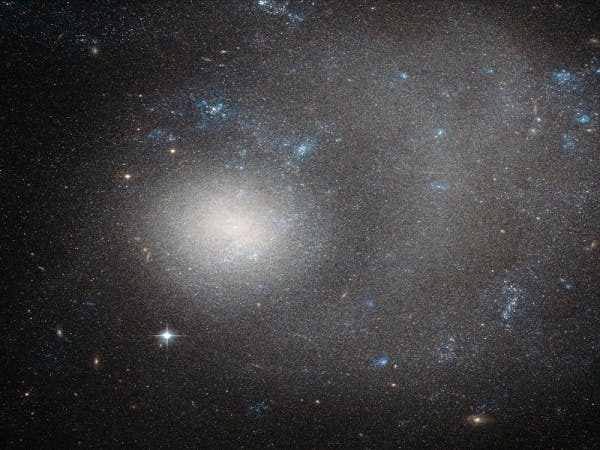 “Co-orbiting satellite galaxy structures are still in conflict with the distribution of primordial dwarf galaxies,” said David Merritt, professor of astrophysics at Rochester Institute of Technology. The image above shows the Crater 2 dwarf galaxy in survey data collected at the Very Large Telescope in Chile that harbors red giant stars and horizontal branch stars — both old, evolved stars that mark an ancient stellar population separate from the youthful Milky Way disk. Crater 2 lies 391,000 light-years from Earth. That makes it one of the most distant dwarf galaxies known. It’s also one of the largest: at 6,500 light-years across, it comes in fourth among our galaxy’s dwarf neighbors, after the Large and Small Magellanic Clouds, and the torn-apart Sagittarius dwarf galaxy. A new study pokes holes in the current understanding of galaxy formation and questions the accepted model of the origin and evolution of the universe. According to the standard paradigm, 23 percent of the mass of the universe is shaped by invisible particles known as dark matter. The team of 14 scientists from six different countries replicated the earlier analyses using the same data and cosmological simulations and came up with much lower probabilities — roughly one tenth of a percent — that such structures would be seen in the Milky Way and the Andromeda galaxy. “The earlier papers found structures in the simulations that no one would say really looked very much like the observed planar structures,” said Merritt.